It was announced early this morning on the UFC Europe Twitter that Germaine De Randamie vs Anna Elmose has been added to UFC Fight Night 87 May 8 at Ahoy Rotterdam in Rotterdam, The Netherlands. This show will air on Fox Sports 1 in the US and TSN in Canada. I expect this match to air on the prelims. 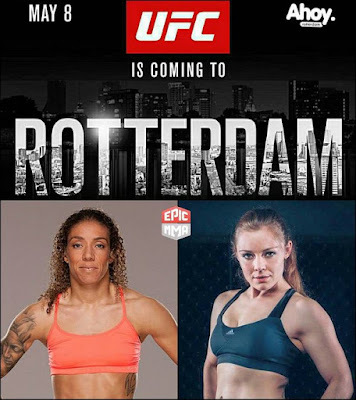 Of course Germaine is a native of The Netherlands so I'm sure she is very excited to fight in front of her family and friends. Germaine trains at American Kickboxing Academy in San Jose, CA. Germaine is a kickboxing legend in Europe but her MMA results have been mixed at best because she is vulnerable on the ground. She has a 2-1 UFC record and her last win was Mar. 2015 over Larissa Pacheco who suffered a broken arm. Germaine was scheduled to fight Sarah Kaufman on the Dec. UFC show in Orlando but she was forced to pull out due to injury. Anna is from Copenhagen, Denmark. She has finished all three of her fights by TKO. You might have seen her on a Nov. 2014 Cage Warriors show and she was scheduled to fight on an Apr. 15 Cage Warriors show. She trains at Rumble Sports which is also the home of undefeated UFC fighter Nicholas Dalby and Pannie Kianzad. Germaine has a significant height advantage so if she can keep Anna at a distance, Germaine should be able to win by decision. On the other hand, if Anna can get it to the mat, she could get a finish. That's what she should try to do as Germaine has questionable takedown defense. With her reputation as an elite kickboxer and her size, there are already fans wondering why Germaine wasn't booked to fight Cris Cyborg. The answer is easy. Germaine fighting at home is always going to be the UFC's first choice. I'm sure Germaine would have accepted the Cyborg fight if offered. But it wasn't offered. And that's why without knowing who was offered the Cyborg fight, I don't believe Dana White's comment that Leslie Smith was the only fighter to accept that fight. It's a bunch of baloney.